The accused — Marilyn James and her son Dennis Zarelli, both of the Sinixt Nation — were scheduled to appear at BC Supreme Court in Nelson this morning. However, when their case was called before Justice Mark McEwan, only James was present. A man standing in for Zarelli, who asked to be called Justin, explained that his friend was unable to attend court because his wife had recently died. “He doesn’t get to decide if he comes or if he doesn’t come,” the judge quipped. Justin attempted to read a statement from Zarelli, but McEwan refused to hear it, instead suggesting that he could have Zarelli arrested and brought to the courthouse if necessary. But crown counsel lawyer Trevor Shaw said there was no need, since they were only there to set a date for trial and he had received prior notice that Zarelli would not be present. James said she would relay the information to her son. The judge set the trial date for May 20 at 10 a.m. in the Nelson courthouse and a pre-trial hearing for March 31 at 9:30 a.m. He recommended that James and Zarelli seek legal counsel, as they have been representing themselves up to this point. The pair were first arrested on March 4 for blocking Perry Ridge forest service road, contrary to a court injunction. They were released on the condition that they not return to the site. Sinixt Nation members and their supporters were on the road to prevent Galena Contractors of Nakusp from extending the logging road deeper into the forest in order to harvest about 5,000 cubic meters of timber on crown land. Outside the courthouse James explained that Sinixt artifacts would be disrupted if logging proceeds on the land. However, she acknowledged that the Sinixt have struggled with the court system for decades without ever seeing a ruling in their favour. She hopes for a different outcome in this case. 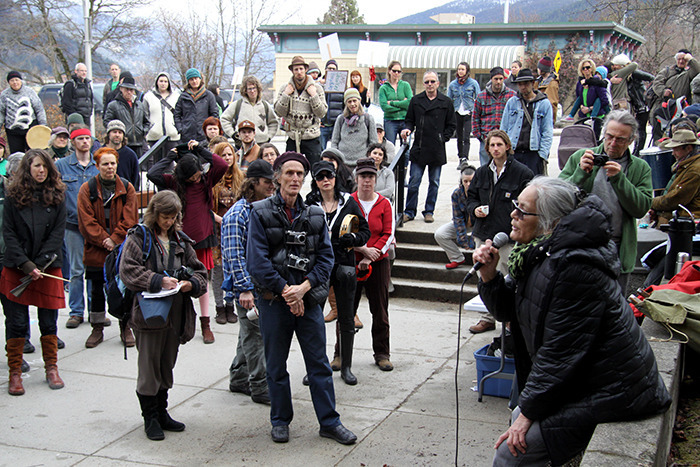 There is significant public support for Sinixt effort to protect Perry’s Ridge. About 130 gathered for a rally near the courthouse following James’ time in court Monday, and similar events were staged at previous appearances. Posted on March 17, 2014, in Uncategorized and tagged anti-logging, Dennis Zerelli, Marilyn James, native blockades, native protests, Sinixt. Bookmark the permalink. Leave a comment.